We manufacturer Milk Cooling Tank having direct expansion refrigeration system. It is available in capacity from 500 - 5000 liters capacity. 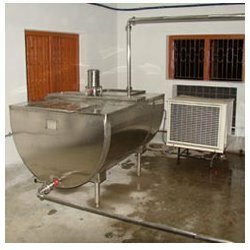 These bulk milk coolers are designed as per ISO 5708 2 A II standards. we have supplied and commissioned more than 2500 bulk milk coolers in India. Bulk milk cooler in range of capacity 500 - 3000 liters are available in rectangular, top open configuration while 3000 liters and above are available only in elliptical, closed configuration. Looking for Bulk Milk Coolers ?